A stunning villa located on the tranquil beach front at Laem Sor. This recently completed home has been designed to accentuate comfortable and convenient living in a tropical environment. The spacious villa combines a breathtaking location, high quality furnishings and an array of modern facilities to make the perfect holiday home. This sumptuous beach front villa has been designed by a renowned architect and is set within landscaped grounds. The style of the villa is understated yet luxurious in all it has to offer. It has extensive living spaces in an idyllic setting offering guests the ultimate private and secluded getaway. There are a great range of added features to entertain. The lovely combination of space and seclusion make this villa the perfect place to gather the whole family or to holiday with close friends. 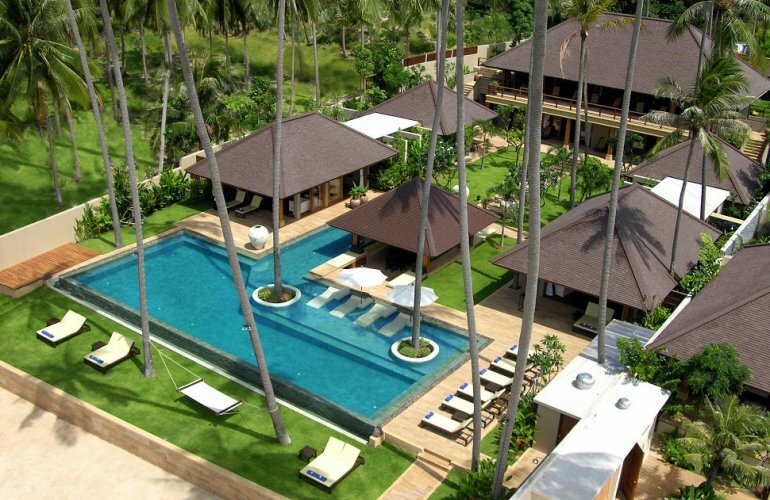 The villa is one of Koh Samui's most lavishly appointed residences. It offers the very best in luxury and service. The villa manager and staff are always available, ensuring the very best in comfort and relaxation. They will be pleased to organise an in-villa massage and spa treatment on your behalf. The beautiful grounds have stunning features including a stepped pond with koi carp, a courtyard water feature complete with waterfall that cascades into an ornamental pond with a sunken Jacuzzi at its centre. The classic décor throughout the property is quintessentially Thai in style with wood flooring and wood panelled vaulted ceilings with complementary Thai artworks and accessories. The main open plan grand room is located on the upper level of the main pavilion and is designed to maximise space with full length windows that run across the entire length of the building giving guests a constant reminder of the amazing views. This area contains a fully equipped gourmet kitchen and a twelve seat dining table perfect for gathering everyone together at meal times. The living and entertainment areas include an audio visual system with plasma screen TV and surround sound technology. The audio system is linked to every part of the house, both inside and out. Overlooking the enormous pool area is a veranda which is partially covered by an overhanging roof. Here guests can relax in colonial style loungers while gazing out over the pool and to the beach beyond. Open stairways lead down to the ground floor from both ends of the upper level. The villa has six spacious bedroom suites in three different design styles. Each bedroom features an en-suite bathroom complete with a large walk in shower and luxurious free standing oval bath tub. Two of the bedrooms have additional outdoor shower areas. All the bedrooms have double beds and their own satellite TV/DVD players and personal safes. For private relaxation each room has its own private patio equipped with a pair of colonial style loungers overlooking the gardens and the ocean beyond. There is a huge swimming pool with submerged loungers and a swim up bar surrounded by a sun bathing terrace with several cushioned sun loungers. Here also, a sunken dining pavilion fully equipped with an outside kitchen and a barbecue for the ultimate dining experience. The villa is located on the Southern coast of Koh Samui and offers the perfect location for a private beach getaway. It's a 45 minute drive to the airport and 15 minutes to Lamai where you will find a variety of bars and restaurants. During the summer months the reef can be dry for up to 100m. The beach is ideal for various ball games and a perfect place for the children to explore the rock pools. Published Rates include Service Charge and Government Tax where applicable. Note: Until confirmed rates are subject to change without notice. To reserve this villa we require a completed booking form and an initial deposit of 35% (50% Christmas/New Year) of the total amount due. For bookings of less than 1 week (3 - 6 nights) or for bookings made within 8 weeks of arrival, full payment is required at the time of the booking. Payment of the outstanding balance must be received at least 8 weeks prior to arrival. We accept payment by bank transfer or credit/debit card (a transaction fee is applied to all card payments). Copyright © 2019 Samui Island Villas. All rights reserved.